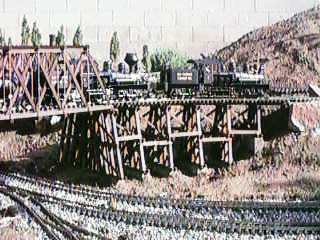 Two new Bachmann Shays are pulling a cut across the new trestle. These engines are 1:20.3 scale and are about 50% too big to be pulling the 1:29 scale rolling stock. However, I like them and I run what I like. One of these Shays has migrated to the GIRR Mountain Division since this picture was taken.